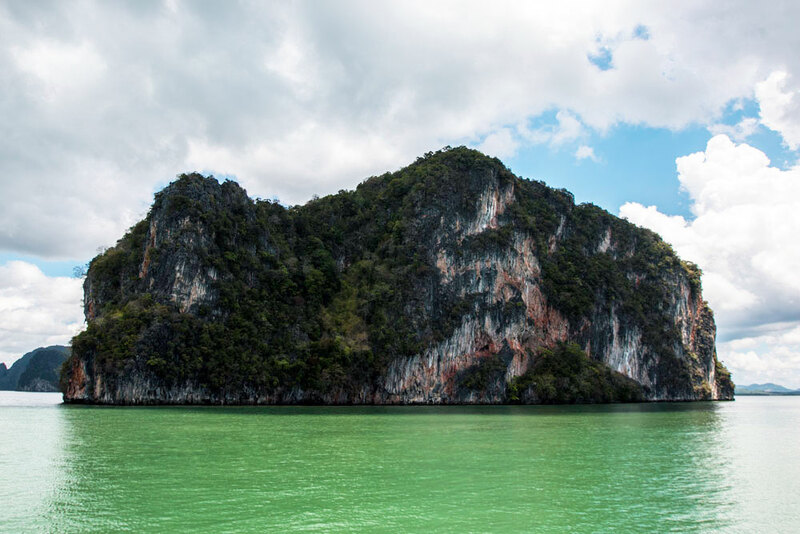 If you love adventure and nature, Phang Nga Bay in Thailand one destination you need to tick off your bucket list – now. You will no doubt recognise it from countless post cards, travel guides and photos featured on travel websites. It’s one destination I never thought I would have the opportunity to explore! The most distinctive features of Phang Nga Bay, and what makes it such a popular spot to explore, is the sheer limestone karsts that protrude vertically out of the mint green water. It really is a sight to see! As with travelling, there is a lot to learn on the road. So I thought I would pull together 6 secrets every traveller should know about Phang Nga Bay in Thailand. 1. Phang Nga Bay is huge so I highly recommend hiring a driver with a speed boat to take you around the Bay. This option is perfect if you’re time poor or if you want to maximise your exploring time. However, I suggest leaving a whole day to explore the Bay. The dramatic limestone islands are truly spectacular and there is nothing like being able to cruise at your own pace and enjoy many of the quiet beaches. Trust me – its far more rewarding than a standard boat tour. 2. James Bond Island, formally known as Kho Ta-pu, is absolutely stunning. But unfortunately it has been turned into a serious tourist spot. Expect a plethora of long boats battling noisily to take you into shore, locals selling trinkets from a professional looking set of market stalls and lots, and lots of tourists. Not fun! Try and visit first thing in the morning to avoid the crowds and so you can get a clear shot of the striking limestone karst. There is nothing worse than battling hoards of tourists with selfie sticks. 3. On the subject of selfie sticks, I am by no way against them, however I was blown away when I jumped off the boat to explore Lawa Island and saw that 90% of women in the water were taking photos of themselves using selfie sticks instead of actually enjoying the experience of being in the water one of the most beautiful islands in Thailand. Tsk tsk. Haven’t they seen Walter Mitty?! Anyway Lawa Island is gorgeous, utterly gorgeous. There are two idyllic swings offering a perfect photo opportunity. Do get photos here but wander off on your own along the shore to the very end of the beach and climb over some trees - you’ll be rewarded with the most spectacular view of Phang Nga Bay and is the perfect spot to avoid the crowds. 4. Make sure you book a tour or your speed boat driver can take you to explore some of the hongs (caves) in and around Phang Nga Bay by sea kayak. For a small price of 100 baht, you can get a local to take you around in asea kayak. It not only offers a respite from travelling by boat but it gives you the opportunity to get up and close to the limestone islands and caves. Koh Panak and Koh Hong are the best spots! 5. If there is one thing Thai people organise well on a tour, it’s food. Luckily for me, Thai (and Japanese) food is one of my favourites. If you are embarking on a day tour, make sure lunch is prepared for you. Exploring Phang Nga Bay whilst tucking into a red duck curry with pineapple and lychees is simply divine. 6. Adventuring around Phang Nga Bay can get hot, very hot. Pack plenty of water (although your tour should provide plenty of fresh bottles), sunscreen, a hat, swimsuit, sunglasses, towel and sandals. And your camera – you don’t want to forget this! Bonus Tip: The port where you jump on various boats to explore Phang Nga Bay is located about an hour from Phuket by car. So it’s easily reachable for a half or full day excursion. If you want to base yourself in Phuket and do a trip out to Phang Nga Bay, I highly recommend staying at Centara Blue Marine Resort in Phuket. The hotel can organise the tour for you; they can even pay on your behalf and add the tour onto your final bill. Very convenient! Have you been to Phang Nga Bay before? Do you have any other tips for travellers wishing to visit?